For 39 years, Clive Davis, the legendary record company president, has been throwing a big party just before the Grammys. It mushroomed as the years went by, eventually becoming an official Grammy-sponsored event, but it still reflects Davis's love of crooners and famous people of all stripes. So half the fun last night at the Beverly Hilton in Los Angeles was spotting celebrities interacting with each other: Smokey Robinson embracing Berry Gordy of Motown, Miley Cyrus chatting with Redfoo from LMFAO, Taylor Swift hugging Jack Antonoff of fun. We chatted with Krist Novoselic of Nirvana while he and his wife ate their salads; he was attending the party for the second time (he also went last year, when he won a Grammy for his collaboration with Dave Grohl and Paul McCartney). "Do you know who I spotted?" he asked us. "Al Gore!" In case attendees missed the famous guests, Davis spent much of the evening introducing them from his podium (he serves as his own MC). Some of those who got effusive Davis tributes: Tim Cook of Apple, Joni Mitchell, producer Richard Perry, Jane Fonda, Barry Manilow, Berry Gordy, Chick Corea, Common, Nancy Pelosi, Irving Azoff, Kathy Griffin, Joan Collins, Larry King and Mark Ronson. After dinner, NARAS president Neil Portnow introduced Magic Johnson, who in turn paid tribute to Davis with a speech that was distinguished by a moment of silence for Bobbi Kristina Brown and by Johnson repeatedly mangling the name of the Rock and Roll Hall of Fame. Then a three-hour cavalcade of musical performances began, punctuated by Davis's shout-outs to audience members. First up: Grammy frontrunner Sam Smith, who gave credible performances of the standard "My Funny Valentine" and his own "Stay With Me." "Is everybody excited for tomorrow?" Smith asked the crowd, and received tepid applause in return, an early reminder that this large crowd was extremely jaded (and capable of chattering through heartbreaking performances). Next: Smokey Robinson singing "My Girl," accompanied for no particular reason by Aloe Blacc, Miguel, and JC Chasez of 'NSync. The performance was professional but bloodless, until Robinson handed his microphone to Jamie Foxx in the audience, who did a few lines and then passed on the microphone to Philip Bailey of Earth, Wind & Fire, who sang beautifully and hit some crazy high notes. Whether the moment was improvised or planned, it was impressive. Taylor Swift jumped out of her seat, leading the standing ovation – not the only time during the evening that would be true, suggesting that she doesn't act that way at awards shows just because the cameras are on. Robinson (pinstripe suit) then duetted with Mary J. Blige (sparkly orange dress) on his 1981 single "Being With You," their very different vocal timbres blending together effectively. Blige stayed onstage to sing a passionate version of "Doubt," from her excellent and underrated 2014 album The London Sessions. Iggy Azalea did two songs – "Black Widow" with Rita Ora and "Trouble" with Jennifer Hudson – to general indifference from the crowd (perhaps they were secretly members of Team Azealia?) But she acquitted herself well and demonstrated that she's at her best when she's playing off a big melodic voice. While Ora delivered in that department, Hudson basically lapped her. Since Whitney Houston isn't around anymore, Johnny Mathis might be the perfect performer at the Clive Davis party: He's been here long enough to be legitimately described as a legend (79 years old) but is still in fine voice. He crooned his way through a medley of four hits: "It's Not for Me to Say," "Chances Are," "Wonderful! Wonderful!" and "Misty." The ungainly honor known as the Grammy Salute to Industry Icons President's Merit Award, which normally gets handed out to record-company presidents, went this year to a music publisher, Martin Bandier, chairman and CEO of Sony/ATV Publishing. 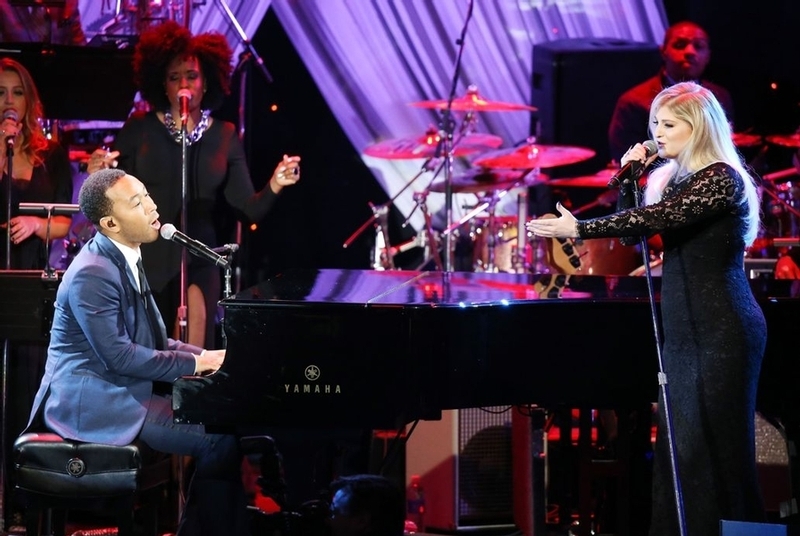 Paying musical tribute to him was Carole King, doing "Beautiful" and "You've Got a Friend" (during which she passed the microphone down to audience members John Legend and Mary J. Blige). 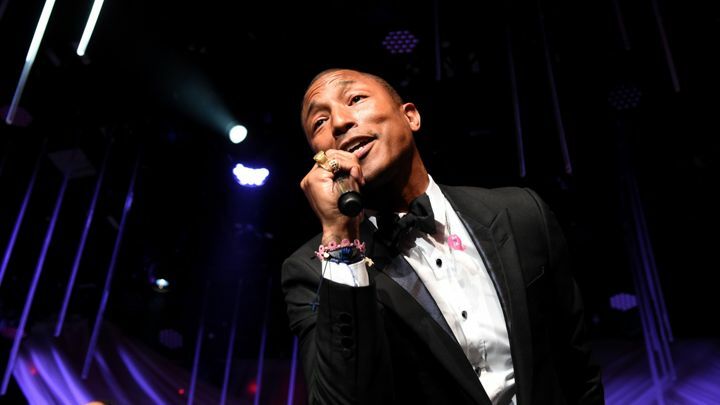 Then Pharrell Williams performed a funky version of "Get Lucky," which actually got the audience up and dancing. When the show tried to move on to a video tribute to Bandier, the crowd got unexpectedly rowdy, chanting for "Lucky." The house band launched into the song, but although it sounded groovy, it was apparently unrehearsed, judging by Williams' comment, "I gotta tell you right now, this key is so high, I don't even know if I can have another son after this." At song's end, he admonished the band: "I'm a producer, so you can't start switching the keys like that, and if you do, you gotta let me know, so a cat can land on his feet." Solo on piano, John Legend did a version of "All of Me" powerful enough that it silenced a schmoozing crowd. Then he brought out Meghan Trainor (they share management) to duet on "Like I'm Gonna Lose You," the song they do together on her debut album. Closing the show: a tribute to the Bee Gees, who are set to receive a Lifetime Achievement Grammy this weekend. The a cappella group Pentatonix did a chirpy medley of some of the group's biggest hits, then Barry Gibb himself (the band's leader, and the last Gibb brother standing) sang "To Love Somebody." He seems to have decided that song is his defining hit; it's also the number he performed on American Idol in 2007. But although his voice sounded clear and powerful, his diction was almost completely abstract, with consonants being cut loose like they were ballast on a hot-air balloon. During his acceptance speech, Bandier forcefully said, "Songwriters are not being adequately compensated," arguing that their income streams have dried up in the digital world without new opportunities compensating. The statement received passionate applause; in a night overflowing with gladhanding and celebrity hype, it stood apart as a substantive statement about the world beyond the red carpet. This article has been viewed 2,749 times since being added on February 8, 2015.